Francis is talking, of course, about the power of example. It doesn’t matter what eloquent words you find to profess your Christian faith, if you’re not living the faith in a way others can see, your testimony won’t be worth a hill of beans. “Do as I say, not as I do” doesn’t cut it, when it comes to Christian witness. There’s another way we can understand Francis’ advice. One way to preach the gospel without using words is through the medium of art. We’ve learned a lot in recent years about left-brain vs. right-brain thinking. Some of us who favor the right side of the brain are true visual learners: you can say it a hundred times, but until you show such a person, the message doesn’t fully sink in. Maybe today’s sermon is a nod to the visual learners in our midst. I got inspired to do this when I was searching for an illustration for the bulletin cover. In rummaging around graphics files on the internet, I came across two remarkable paintings: one modern, the other centuries-old. Looking at those images, I said to myself: “Self, when it comes to proclaiming this Sunday’s scripture, you really can’t improve on what these artists have done.” So, I propose to let their artwork speak. 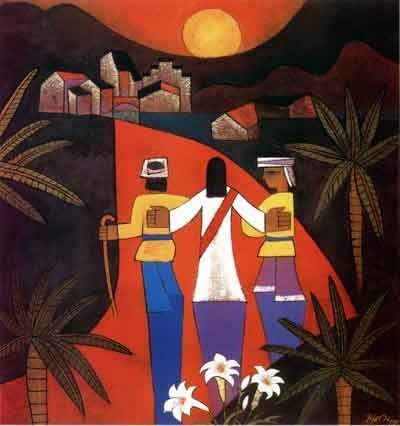 The scripture text is from Luke 24, the story of the road to Emmaus. The risen Jesus catches up with a couple of his despairing followers as they’re walking along the road. These two picked the worst possible moment to leave Jerusalem: they’ve heard the news of Jesus’ death on the cross, but they haven’t yet experienced the joy of his resurrection. Like so many others, they dismissed the resurrection reports as “an idle tale,” and moved on. The dramatic irony is exquisite. We know what they don’t. When it finally dawns on them that this fellow-traveler is Jesus himself, we rejoice with them in that glorious good news. So, let’s turn to our first painting, called “The Road to Emmaus.” You’ll see it on the front of the bulletin. The artist is from China, a Christian by the name of He Qi. He taught philosophy for many years at Nanjing Theological Seminary, but has become most famous for his paintings. They tell stories from the Bible, incorporating elements of Chinese folk art. He Qi now lives in Minnesota, and is producing his art full-time. The first thing I’d like you to notice in the painting is the buildings in the background. There aren’t a lot of them, which tells us these travelers’ destination is no great city. It’s a tiny village called Emmaus, a day’s walk from Jerusalem. Emmaus is nothing special: just a crossroads, with an inn (we suppose) and a few other houses. Think of it as one of those little towns beside an interstate highway: a gas station or two, an all-night diner, maybe a mom-and-pop motel, a few houses — not much else. That’s all there is to Emmaus. Nothing to write home about. A most unlikely spot for a post-resurrection appearance. You’ll also see the sun hanging low in the sky. The red glow of the setting sun is reflected on the surface of the road. The two travelers have been plodding along all day. They’re tired. All they can think about, in these waning moments of daylight, is finding a place to rest their heads. The little village beckons. Off to each side of Jesus are his fellow-travelers. Luke tells us the name of only one of them: Cleopas. The other traveler is anonymous: which is peculiar. A reporter, eager to file the biggest news story in human history, would surely not overlook the name of a star witness. Some scholars in recent years have wondered if, in fact, the second traveler is a woman — Cleopas’ wife, perhaps. There’s nothing in the text that says this other disciple is male: preachers and teachers have just assumed it, over the years. First-century middle-eastern writers (and Luke is no exception) seldom record the names of women — unless they’re queens, or matriarchs, or some other noteworthy figure. Women were not permitted, in that culture, to testify in court. So, it’s reasonable to suppose Cleopas’ name is the only one Luke’s interested in — which is a great shame, because we’d really like to know who that other witness is. Back to the painting. It’s a little hard to see, but extending below the feet of the three walking figures are long, purple shadows: testimony to how late in the day it is. We all know shadows are longest just before sunset. But there’s more going on here. The way He Qi has rendered these shadows, they almost look like some force holding the travelers back. It’s like they’d walked in purple tar, or something else sticky. These two are in grief for their beloved teacher — and, like all bereaved people, for a while they find it hard to get on with their lives. It feels like the past has a hold on them. It’s drawing them back to Jerusalem, the city of woe from which they’ve come. At this point in the story, the dramatic irony remains intact: we know who the stranger is, but his traveling companions still don’t. He Qi can’t resist giving us just a little hint. Did you notice that, way down at the bottom of the painting, there are three Easter lilies? It’s no accident they’re on the Jerusalem side of the picture. Unknowingly, our two travelers are walking away from the very news they’re most eager to hear. They’ve turned their backs on new life. But that’s okay. Jesus will soon set them right! That’s the first painting. The second you’ll find on the back of your bulletin. We printed it sideways to make it as large as we could. The painting dates from another century: the seventeenth, to be exact. 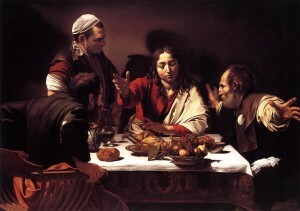 The Italian artist Caravaggio painted “Supper at Emmaus” in the year 1606. It hangs in the National Gallery in London. It’s considered one of the artist’s masterpieces. Caravaggio is renowned among art historians for his mastery of light and shadow. Today we’d say he thinks like a movie director. In this painting, there’s a powerful light source just out of the frame to the upper left, outlining all the principle figures by means of shadows. It’s a dramatic visual technique called chiaroscuro. Caravaggio didn’t invent it, but he was its greatest practitioner. Now, if you’ve been counting, you’ve noticed there are four people in the painting, rather than three. There’s Jesus, Cleopas and the other disciple. The fourth — the only man standing — is an innkeeper. (Luke doesn’t tell us where the supper at Emmaus took place, but Caravaggio assumes it must be an inn.) The innkeeper appears to be disinterested. He’s just doing his job, waiting on tables. He’s not caught up in the moment of surprise. Of the three at the table, it’s obvious which one is Jesus. Which one is Cleopas, you may be wondering? It’s hard to say with 100% certainty, but some keen-eyed observers have noticed that the man to the right of the picture has a seashell pinned to his vest. The seashell is a symbol of James, the disciple — it’s what pilgrims pin to their clothing to this day, as they hike the ancient, five-hundred-mile footpath across northern Spain, to the shrine of Santiago de Compostela. (“Santiago” means “St. James”; the church there contains his relics.) It’s very likely that Caravaggio, following the conventional wisdom of his day, assumed the two Emmaus travelers were men; and, for whatever reason, he identified the unnamed one as James. That would mean, of course — by deduction — that the man getting up from the chair to the left is Cleopas. The painting is filled with anachronisms, as most religious paintings of that era are. The furnishings, the tablecloth, the clothing — even the plates, cups and food spread on the table — would fit right in, in a seventeenth-century Italian country inn. The two disciples are attired like Italian tradesmen. They look a little shabby, if truth be told. Cleopas’ sleeve is split at the elbow. The other man’s clad in a workingman’s leather vest. The artist wants us to make no mistake: these are humble, ordinary men: peasant stock. There’s no mistaking the fact that Jesus dominates the picture. All the geometric lines in the painting’s design point to him. Caravaggio captures, here, the dramatic high point of the story — the moment, after Jesus has broken the bread, when “their eyes were opened and they recognized him.” You can see surprise in the posture of the two disciples: the one on the right has thrown his arms open in astonishment, and Cleopas is pushing his chair back from the table, abruptly standing up. Now, I’d like to ask you to notice something not in the painting. There’s an empty place at the table, right at the foreground. It’s almost as though there’s another chair, just out of the frame of the picture. I think that place at the table is set aside for each of us. The artist is inviting us right into the painting, to take our place at the supper-table and share the disciples’ astonishment. If you look really, really carefully, you’ll notice that the fruit basket at the front of the table is balanced precariously on the edge. It’s a silent invitation to us: Come and eat. But remember, you and I can’t see Jesus’ wounds. The others can, the way the picture’s laid out, but we can’t. You and I are not firsthand witnesses to the resurrection, and never can be. Yet — and this is the crucial insight — the artist invites us to take our place at the table, all the same. The detail I’ve never noticed before is the tense of the verb: the angels “said that he was alive.” Past tense, not present. It’s the consensus of a whole lot of Bible translators that the Greek original says this very thing. I checked the major English translations, and every one’s the same. Cleopas and friend are saying Jesus was alive for the angels to see; after that, who can say? They could have had the angels reporting “that he is alive.” But they don’t say it. They don’t, I expect, because they’re not yet ready to accept the full implications of resurrection. The implication is that this world and everything in it has been changed forever. The good news of the first Easter morning is not that, one day long ago, a man was dead and then came alive. The wonder is that this risen one continues to live, continues to rule, continues to make a difference in the lives of each and every one of us — if we but let him. That blessed two-letter word — “is” — makes all the difference. He is alive! It’s very much like Caravaggio’s painting. The seating at the Emmaus supper-table is not complete. There’s an empty place for each of us. Heed well the invitation from the risen one, who is host at this banquet: Come and eat.